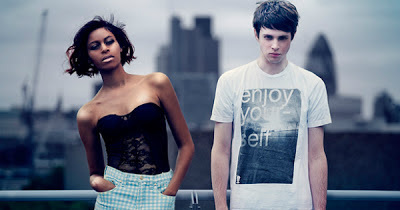 Discopop Directory: What does the internet know about AlunaGeorge? Amazing musical portmanteau AlunaGeorge have just announced their new single, Attracting Flies. If you haven't been following the progress of the St Albans-based band, where have you been? They were the most-blogged about artists of 2012 (ok, not necessarily a recommendation) and came second in the BBC's Sound Of 2013 list. As a result, the "proper" media has latched onto the future-funk electro-pop R&B duo and booked some interviews. Here's what we've found out by reading all the articles about Aluna Francis (she's the girl) and George Reid (he's not the girl) we could find. Attracting Flies is out on 10 March, but Body Music won't be in shops until July.